On Wednesday, the Game Developers Conference held the 19th annual Game Developers Choice Awards. This years coveted Game of the Year award was won by God of War. Though the awards and big names took center stage, the presence of Game Workers Unite could not go unnoticed. GWU is an organization that advocates for the rights of workers in the gaming industry. They may not have been directly on the stage, but a number of people in the spotlight of the Game Developers Choice Awards lent their voice to their cause. For Tim Schafer to be part of this bit is interesting seeing as how Double Fine is not a unionized studio. Later in the event, Schafer returned to the stage. 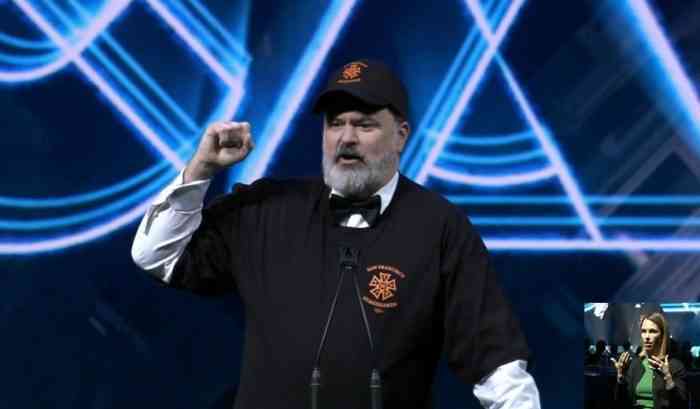 Over his suit, he wore a t-shirt and hat, both with the logo of the International Alliance of Theatrical Stage Employees Local 16. This group is the union of the workers who are responsible for making the event possible. Do you think AAA game developers should be taking steps toward unionizing? Let us know in the comments below.